I’m a second year PhD student at the University of Nottingham. Having never done any teaching before, this blog will document my first semester of teaching first year undergraduates. My research focuses on print and political culture during the late eighteenth and early nineteenth centuries. I’m teaching on an introductory module which looks at the Early Modern period between 1500 and 1789. My thesis focuses on 1790- 1832, so to some degree I feel a little out of my depth teaching a period I’m not studying myself. Despite knowing that much of this first seminar would be devoted to getting the students to introduce themselves and explaining how the seminars over the course of the year would run, planning still took longer than I expected. I think one of the problems was that I gave myself too much time to plan. This was perhaps because as I haven’t studied the Early Modern period for a couple of years, I wanted to make sure I felt confident with the subject in case students asked questions relating to it. I’m conscious that, as a postgraduate student, teaching should not take up as much time as I have so far allowed. In preparing for my second seminar, I purposely left myself less time to prepare, and I still had enough material for the class. As well as explaining the basic outline of the module, what will be required of students, and what topics we would be covering during the rest of the module, I decided it was important to get an idea of what the students knew about the Early Modern period. I know from my own experiences, that much of what students tend to study at GCSE and A Level often centres on Modern history, and so some may be studying Early Modern history for the first time. I therefore asked them to think about the main themes of the period in small groups and to feed back their ideas to everyone else. I found this activity really helped to assess what level the students were at. Finding this out at an early stage is useful as it will give a good indication of what level to pitch future seminars, something which new tutors often struggle with at first. Despite over planning, I was worried I was going to run out of material, as I covered some things quicker than I had anticipated. Without much experience it’s difficult to judge timings accurately. The group activity meant that the seminar did finish on time, rather than after half an hour as I originally thought it would. I’ve learnt that group activities can be really useful in keeping to time, so I’m intending to base future seminars around group activities and discussion. As I was one of the last to teach my first seminar amongst my fellow postgraduates, I was able to benefit from their first experiences. Hearing about the problems which they encountered was reassuring, as this meant that I was able to prepare and plan how to address them in the seminar. One of the things that other tutors came up against was that their students were unsure of how to find the set reading or use the library catalogue to access e-books and journals. Building on their experiences, in explaining what students would be required to prepare for the following week, I made sure that they were sure of how they should find the reading. In these early seminars, attempting to foresee problems before they arise and explaining everything from the outset means that I don’t expect to have too many problems later in the semester. Generally, I felt more awkward during the seminar that I had expected to, although talking to other people about their first seminars, this seems to be fairly normal. Most people commented that they felt overly nervous before and during their first class. When describing what I did during this first seminar, the general consensus amongst friends seems to be that it perhaps went better than I thought it did. I’m hoping that this is true and that my students found the experiences far less awkward than I did! My second seminar seemed to go a lot better. Although I still was nervous about it beforehand, partly based on my experiences of the week before, the actual seminar wasn’t nearly so bad. You make some very interesting points about planning. I like the idea of restricting the amount of time which helps you to focus on the absolute essentials, as that is exactly what first year students need to grasp as well! You are absolutely right that group activities are the way forward. 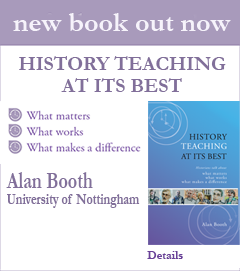 They are, as you say, adaptable in a way that going in to a class with a prepared script is not, so in terms of practicality as well as the clear pedagogical benefits, group work should form the basis of effective History teaching at this level. I would suggest that once you are a few more sessions down the line or at the end of the semester you get the students to reflect on how they feel the seminars are going so that you can respond to any of their points in semester 2. It also helps them to realise that reflection on what happens in class in terms of activities, discussion, Q&As etc. is a vital part of their progress alongside finding out about the past. I have found with first years that a short quiz at the end of semester one which focusses on what has been covered in class works well. It’s always strange to start teaching students when you are a student yourself. And the first class on any module is always packed and full of feelings of both uncertainty and possibility as I wrote in a blog ‘The First Class’ on this site. What came out strongly to me from the blog is the uncertainty that new tutors and the students share. It’s really easy to get caught up in one’s own anxieties as a new tutor, and it’s important not to forget the students are also anxious. After all it’s a new experience for them too and first-years are often unsure about basic procedures such as how to use the reading lists or access the reading (however many times they’re told), and suffering from information overload. Planning is really important – not least to feeling more secure – and there is always a fear you’ve got too much material (I found this worst in my early lectures where I was massively over-prepared). But it’s important not to have too rigid a plan and to leave space for spontaneity and unpredictability in discussion. This admittedly is always an issue in a 50 minute seminar because you want to get through a decent amount of material. But if they come out with 2 useful new ideas on a topic I always think you’ve done your job; there’s no need to try to pack too much in. Control is a seductive thing: too much can feel controlling to the student and lead to them refusing to speak; too little can lead to to chaos. But I still think relaxing control (gradually?) is important so they see this is their seminar – after all only they can do the learning. You did well to break them into groups for a while which also shows them a seminar is a collaborative effort. Finding the balance between control and freedom just comes with experience and with trying things out – so keep trying new things. I think finding out about how much the students know about the subject area at the beginning is also a good strategy. What did it tell you? It can also be helpful to find out what they expect from a history seminar – their views might be shaped by previous experience that is different from your view. Getting expectations clear and aligned is important. And use your own experience of seminars, good and bad, to guide you. Some really interesting observations here, Hannah. I must admit that when I started teaching, I tended to over-plan too, mainly out of fear that without a detailed, almost scripted plan the class would descend into anarchy! However, as Alan says over-planning can stifle good teaching, and I often found myself shutting down excellent activities or ideas for fear of us going off-plan! I now plan far less, but I still find it helpful to keep a skeleton structure of learning objectives, activities and key questions for each seminar I teach, which I tend to share with the students at the start of the class and then return to in my concluding comments. I really liked that you got the students into the habit of working in groups from your very first seminar. Learning is a collaborative process – although there is much to be said for reading an article alone in the library, we learn so much from working with others – and working in small groups to share ideas and discuss concepts contributes to that collaboration and deepens learning and understanding. Group work and discussion is also a subtle way of introducing students to differences of perspective and interpretation and underlining that there is no right answer – key concepts for history teaching. I would encourage you to keep doing this, and explain to the students why you are doing it too! I also really liked your idea about gauging students’ perceptions/understanding of early modern history at the start of the year. As you say, this is a very helpful exercise for you, as it allows you to gauge how much your students know already and how you might pitch your forthcoming classes. But it is also helpful for the students. It alleviates anxiety and breaks down barriers, as it helps them to realise that they are not alone in learning what are likely to be very new and challenging topics. And, later in the year, it will enable them to see how much they have learned during the module. It might be interesting to repeat the task at the start of the Spring semester, or perhaps at the end of the year, to see how far the students have come in their knowledge/understanding of early modern history. You could keep their brainstorms/ideas from your very first class and ask them to compare those with what they know now. This would allow both you and the students to, 1) reflect on what has been taught and learnt – reflection is a great tool for learning, as Ross says – and 2) hopefully give yourselves a good pat on the back for some excellent learning and teaching over the course of the year! Wow, this takes me back. Over-preparation, fears of running out of material, not knowing the level at which to pitch material: these are all issues which I guess most of us will remember from our teaching our first seminar. The difference is that (unlike me) you worked out strategies so fast and so effectively. Rationing the time you devote to preparation is a smart idea, as is using group work to introduce flexibility over timings. What I liked most is your tactic of measuring understanding of the subject matter at the beginning of term. As Joe Merton suggests, it would be interesting to revisit their ideas at the end of the course, not least because it will provide continuity between seminars. The other difference between your experience now and mine a couple of decades ago is that you are discussing your experiences with other seminar tutors in quite a systematic fashion. This certainly makes teaching a less solitary endeavour and leads to a reflexive approach that is also exemplified in this blog. Not every seminar will go well and you may well experience the frustrations that your teaching doesn’t necessarily translate as you hope and expect into your students’ learning. But, in terms of your own process of learning about teaching, it sounds as if you’re doing everything right.